WASHINGTON, DC, June 13, 2011 (ENS) – The United States needs to stop buying so much farm-raised fish from other countries and start producing its own, the Obama administration officials said Friday, releasing the first set of national sustainable marine aquaculture policies. 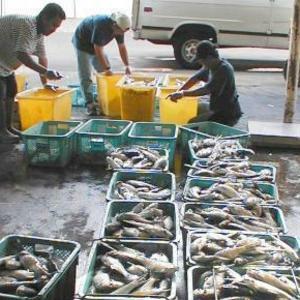 Foreign aquaculture accounts for about half of the 84 percent of seafood imported by the United States, contributing to the $9 billion trade deficit in seafood, said Commerce Secretary Gary Locke. Global wild fisheries are in decline, with habitat such as estuaries in critical condition. But the farming of fish that eat other fish, like salmon, does not help. Numerous studies have shown that salmon farming has negative impacts on wild salmon, as well as the forage fish that need to be caught to feed them. Aquaculture can be more environmentally damaging than wild fisheries on a local basis. Concerns include waste handling, side-effects of antibiotics, competition between farmed and wild animals, and using other fish to feed more marketable carnivorous fish. To maximize growth and enhance flavor, aquaculture farms use large quantities of fishmeal and fish oil made from less valuable wild-caught species, including anchoveta and sardine. “Aquaculture’s share of global fishmeal and fish oil consumption more than doubled over the past decade to 68 percent and 88 percent, respectively,” wrote Rosamond Naylor, a professor of environmental Earth system science at Stanford University and director of the Stanford Program on Food Security and the Environment in a 2009 study published in the Proceedings of the National Academy of Sciences. Developing a National Shellfish Initiative in partnership with the shellfish industry to increase commercial production of shellfish, which would create jobs, provide locally-produced food, restore shellfish populations and habitats, and improve water quality. Implementing the Gulf of Mexico Fishery Management Plan for Aquaculture, which includes the regulatory infrastructure needed for offshore aquaculture development in the Gulf. The domestic aquaculture industry – both freshwater and marine – currently supplies about five percent of the seafood consumed in the United States. The cultivation of shellfish, such as oysters, clams, and mussels, comprises about two-thirds of U.S. marine aquaculture production. Salmon and shrimp aquaculture contribute about 25 percent and 10 percent, respectively. Current production takes place mainly on land, in ponds, and in states’ coastal waters.